The Hydro Blackstar 180 watt LED grow light is designed to support plant growth throughout a plant’s entire grow process. It is specifically engineered to enhance the flowering stage of plant growth while emitting a beneficial “light recipe” that research shows supports optimal plant development. The Hydro Blackstar 180 watt emits both blue and red light while including 6 bands of light wavelengths that fall within the photosynthetically active radiation zone. The Blackstar LED is built to run effectively and efficiently and could be the best LED grow light for an indoor grower. In the rest of this comprehensive LED grow light review, I will detail the product specifications so that growers can make a more informed decision before selecting the LED grow light that best suits their needs. My hope is that this information better enables indoor growers to grow big at home! Power and efficiency stems from the units inclusion of sixty individual 3W LEDs. The light size is effective for flowering plants, but has been designed to do the job during the whole grow process. The Blackstar 180w light will support the vegetative and bloom stage by presenting 6 bands of unique color wavelengths of light which research shows supports uniform plant development by enhancing actions associated with PAR. Chlorophyll, which is the most abundant plant pigment, is efficient in capturing red and blue light. LED grow lights that emit this type of light provide an appropriate “light recipe” which optimizes the plant photosynthetic process. This type of light falls within the photosynthetic active radiation zone or PAR and the Blackstar LED grow light is engineered to emit light that optimizes photosynthesis. 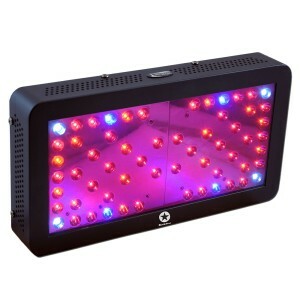 The Blackstar 180 watt grow light emits red, blue, UV, IR and white light wavelengths. The specific wavelengths include, IR: 730nm, red: 630nm, 660nm, blue: 425nm, UV 380nm, white: 12000K. Plants absorb the energy from the LED light efficiently in order to excite the process of photosynthesis so plants can synthesize food. The BlackStar grow light proportions the light wavelengths to excite PAR associated activity during plant development. Giving plants these specific wavelengths is one way that the Blackstar can effectively and efficiently support plant development during the vegetative and flowering stages of development. Red 630nm – Red light in this range of the visible spectrum will encourage blossom and fruit. Light in the red range helps to maximize the photosynthetic process and chlorophyll absorption. The red range of light wavelengths are necessary for the blossom stage of plant growth and therefore, the red range of light will help an indoor grower achieve a successful yield. Red 660nm – Deeper red wavelengths such as this also help to excite the photosynthesis process which maximizes chlorophyll absorption to support the flowering and bloom stages of plant growth. The deeper red wavelengths are necessary to support abundant flowering and yield. 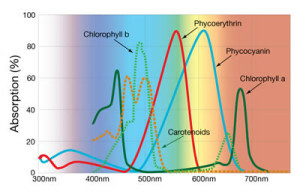 Blue 425nm – Light wavelengths in the blue spectrum affects chlorophyll formation, photosynthesis process and raises the photomorphogenetic response. It helps to mediate plant responses such as chloroplast movement, stomatal opening and seedling growth regulation. The blue wavelengths encourage vegetative growth via strong root growth and active photosynthesis. Infrared 730nm – Infrared is not often used in abundance but can be helpful during the end of each light cycle to promote flowering, specifically in short day plants. It can be useful for plants requiring low levels of photoequilibrium to flower. Ultraviolet 380nm – Like Infrared, Ultraviolet is not proportionally utilized in abundance but small amount of near UV light can be beneficial to plants. A small amount of UV light can enhance plant color as well as plant aromas and taste. White Light 12,000k – Sunlight is the natural catalyst of plant photosynthesis outside. White light from the sun is a mixture of all colors of the light spectrum from red through violet. White light is added in smaller proportions in some grow lights which helps to mimic the type of light plants would get from the sun and encourage the process of photosynthesis. The Blackstar 180 LED emits the type of light that is research proven to best benefit plant development. The Blackstar LED Grow light not only includes red and blue color wavelengths, but it also includes IR, UV, and white light. LEDs integrated into the Blackstar LED grow light are rated to have a lifespan of at least 40,000 hours. The longer lifespan of LEDs over other traditional grow lights like HPS or fluorescent lights will save an indoor grower money over the long term. LED grow lights like the Blackstar are energy efficient and since they consume less energy than other traditional grow lights, they can save an indoor grower money over the long term. The Blackstar LED grow light, like all LED lights, produce less heat than other traditional grow light alternatives. Producing less heat allows the indoor grower to save money on more expensive ventilation systems or air conditioning units. The small and efficient build of the LED grow light can be used in a variety of grow room set-ups. Using LED grow lights can be done in a flexible manner and the “plug and play” design is easy for the novice indoor grower. The Blackstar 180 watt LED grow light alone is not powerful enough for commercialized set-ups. 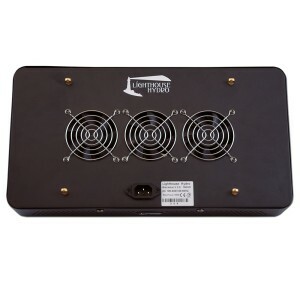 It is designed for the small grow set-up of an indoor grower. An indoor grower must always keep product specifications in mind, specifically the light footprint zone. Once plants are place outside of this optimal light range, plant development will suffer. 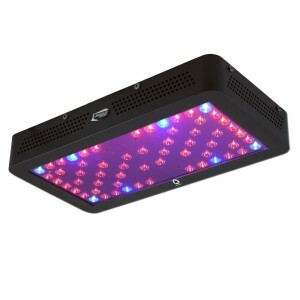 Given the wattage, this grow light should be placed in close proximity to the plants. Growers share that this light works for flowering and should be placed in close proximity to the plants. The good news is that because LEDs produce very little heat, they can be placed quite close to the plants to optimize light penetration into the plant’s canopy. Others have expressed some concern that some of the information on the manufacturers website is written in a different language. 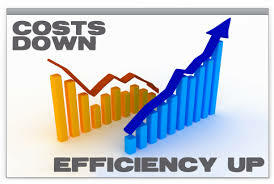 I found this to be the case as well when researching information on the Blackstar 180 watt LED grow light. This comprehensive LED grow light review reveals that the Blackstar 180 watt LED grow light is designed for small indoor grow scenarios. It emits blue, red, infrared, ultraviolet and white light which research reveals is very beneficial for healthy plant development. The makers recommended that plants remain within the light footprint of 6 square feet. As is the case with all grow lights, the outside perimeter of the light footprint is less intense than closer to the center. Keep this in mind when considering this, and all other grow lights. Overall, the Blackstar LED grow light is relatively inexpensive for an LED grow light that offers the type of color wavelengths that it offers. So, although it is not one of the most powerful LED grow lights on the market right now, it can be effective and efficient due to its design and the specific “light recipe” that it offers. This light is a good option for the beginner grower or indoor grower looking to provide an optimal blend of light for a relatively small number of plants. My hope is that this comprehensive LED grow light review helps you to find the best LED grow light to suit your specific needs. Good luck with growing big at home!